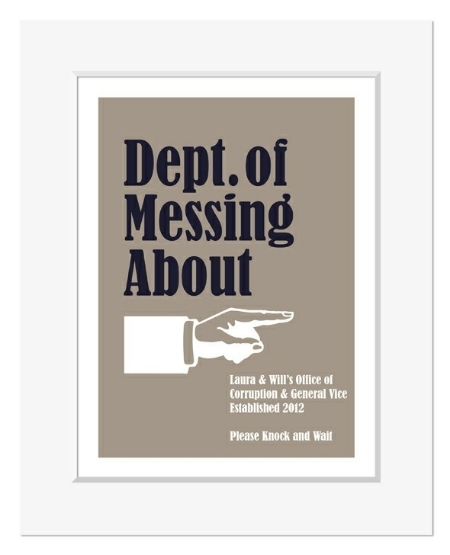 Ministry of Silly | terribly serious personalised prints! Inspiration can hit from various sources, so let's just say I was listening to the budget speech on the radio when these appeared to spring to mind from nowhere...! These personalised prints would make a great gift for lots of different occasions - perfect for a workplace or home office gift of course, but also ideal for a tongue-in-cheek wedding or anniversary gift too. Each print can be completely personalised with your own special message. About your Print: Your artwork will be created to order and printed onto very high quality gloss finish paper stock. It will be posted with a backing board and smooth white finish bevel cut mount, and will be smartly presented sealed in a protective crystal clear presentation sleeve. Your print will be posted in a strong hard backed envelope and will require a signature on delivery. Please allow approximately 1-2 working days for delivery. The print is unframed and has an overall size of 10"x8". It will fit into any standard 10"x8" picture frame, or a larger frame which has a mount with a 10"x8" apeture. This print has a neutral background with dark ink blue and white features. You can personalise your print with up to 5 lines of text. Please use the space provided on the order form to enter the details you would like to appear on your print (double check all spelling before submitting!). This print has a pale blue background with dark, ink blue and white features. You can personalise your print with up to 6 lines of text. Please use the space provided on the order form to enter the details you would like to appear on your print (double check all spelling before submitting!). With a pale blue background and a choice of either dark blue or bright pink (see below) features. You can personalise your print with up to 3 lines of text. Please use the space provided on the order form to enter the details you would like to appear on your print (double check all spelling before submitting! ).